Florida and Miss were mainly drive-throughs, but Alabama was an eye-opener. Leaving Georgia we saw lots of snowbirds with New York and New England plates taking I-95 to Florida. Then we hit the 10 West, and my appreciation for the interstate highway system grew markedly. I had never taken serious road trips before, and I was mesmerized by the fact that I was now on the same road that is part of daily life in Los Angeles. Jenni got excited when we crossed the Suwannee River and put that song on. I still stayed awake and guided us safely to lunch in Tallahassee at Kool Beanz Cafe on the main drag Monroe. Breeze and a covered patio felt nice in the 80 and sunny weather. The Florida State campus looks pretty nice. It is not as charming as many I have seen, but there are plenty of live oaks with Spanish moss. 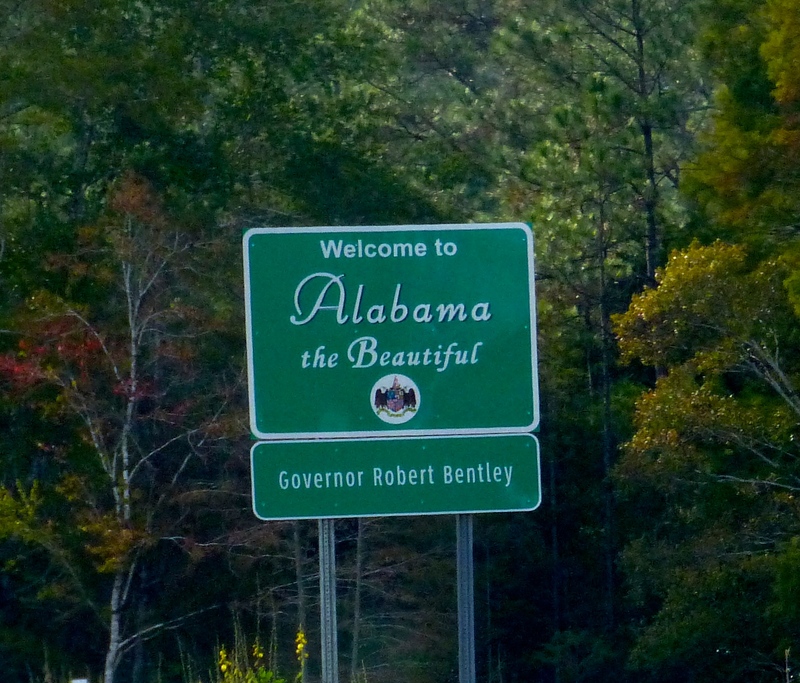 We crossed into Alabama and it felt more like Alabama with lots of Baptist churches, pickup trucks, signs for cheap tobacco, cotton fields and a Crimson Tide helmet mailbox. I think we fit right in blasting Sweet Home Alabama with Sven’s top down. Figuring we will likely settle back in California and it will be harder to visit this part of the country, we had decided to spend a night by Mobile Bay on the way to New Orleans. Some towns were mentioned in our 1,000 Places to See book, and I asked Leura for some recs. She was super helpful and we ended up staying in her hometown. And this day/night was probably the biggest surprise of the whole road trip. In a good way. One of the charming towns is Magnolia Springs, though our first experience here was probably the scariest moment of the trip. We pulled into Jesse’s Restaurant parking lot and it is hard to explain what happened. Basically we were parked in a gravel lot next to the street and next to an opening leading to more parking lot. A car sped in, turned and skidded, then backed up kicking up gravel. We saw another guy sort of chasing it, and then the driver floored it and started skidding on the gravel towards us. I sensed the driver was terrified or enraged, or perhaps a combo, and figured it was mainly down to luck whether he hit us or not. I was not so scared of injury as getting stuck in a repair shop for a few days in Alabama for being in the wrong place at the wrong time. It was a most narrow escape. We drove down to the both brackish and spring-fed river and talked to this guy fishing who had a heavy Southern accent. He was entertaining, talking about fighting a red fish that was 3.5 feet long. But better tasting are trout or the smaller red fish, about 18-23 inches in length. Earlier today I teased Jenni for playing Mozart in the Redneck Riviera, then ate my words when we saw a Values.com billboard promoting him. We took Scenic 98 to Point Clear and the bay-side homes were gorgeous with deep properties and big oaks. The Grand Hotel (a Marriott) is gated but I asked if we could take a look and they were most welcoming. Not that this was special treatment at all, but I think in the South if you are white and appear to have some money then you can probably do anything you want. 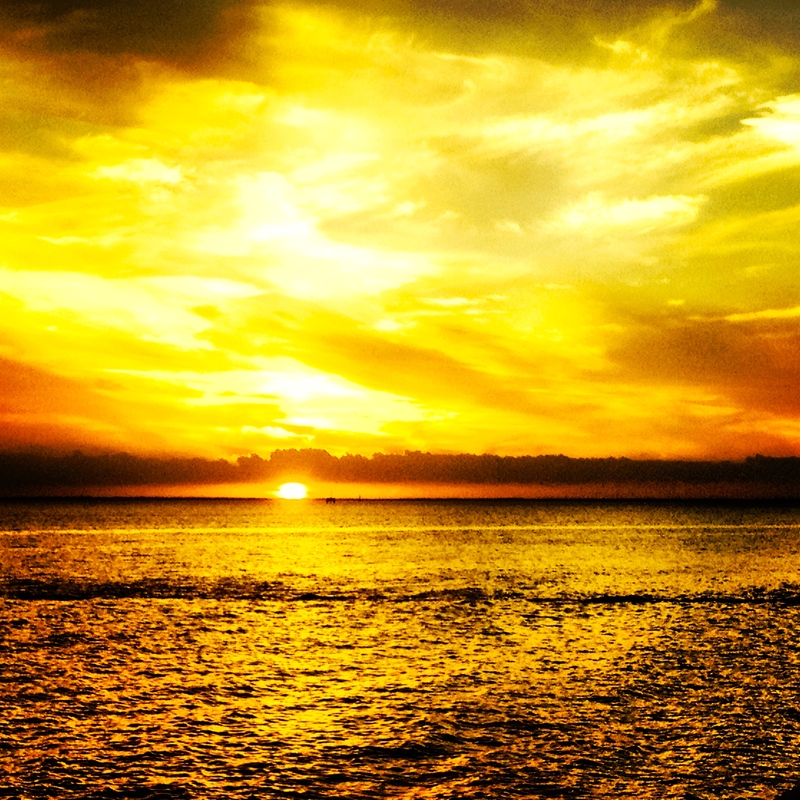 The property was impressive and we caught a phenomenal sunset over the bay. This place has swinging wooden chairs, hammocks, a nice little beach area, a golf course, etc. It would make a fine vacation destination. Lots of people were out walking or jogging and we made a quick stop at the Fairhope pier before parking in town for dinner. I was rendered speechless by the contrast between my pre-judgments and reality. I expected Alabama to feel impoverished and unsophisticated, and perhaps a lot of it is. But you could drop Fairhope in the Hamptons and it would not seem out of place. There were Range Rovers and Beemers all over the place, and high end shops and nice restaurants. Camellia Cafe could have been in Carmel. We had sushi (yup, sushi in Alabama) at Master Joe’s which was great, and we were the worst-dressed patrons. One of the rolls we got was baked with cheddar. Cringe ye purists, rejoice ye lovers of isht that tastes good. I heard this area is increasingly popular with snowbirds. During breakfast at our hotel. Pause. If you are thinking of a proper dining room with an omelet station and ample bacon, think again. I mean the kind where the check-in area is about 150 square feet and has a few tables, some crappy coffee and a little cereal. Play. There was an older couple wearing t-shirts from Newport, Rhode Island and Whitefish, Montana, so it was fun to say we had visited both those spots already on this drive. 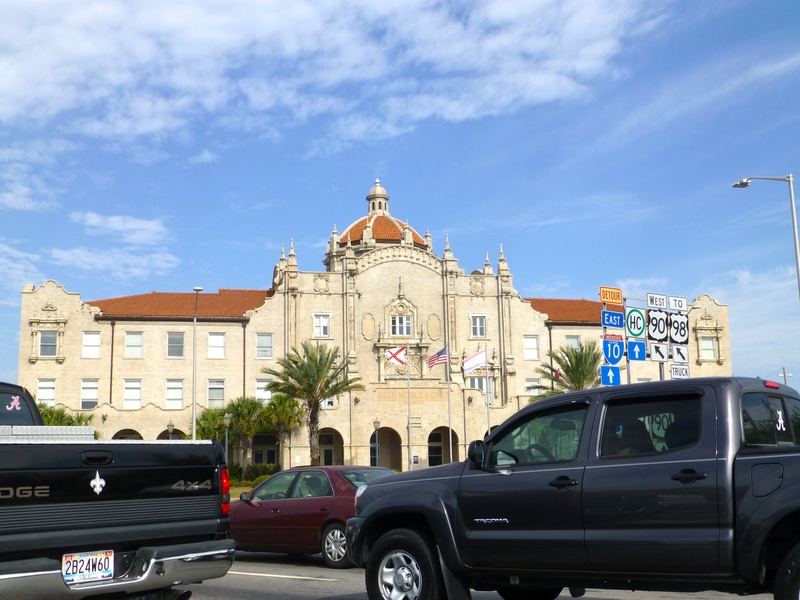 We passed through downtown Mobile on the way to the Bragg-Mitchell Mansion. There were no other patrons so $7.50 (each with AAA) bought us a private tour. This woman was hilarious. There might have been 40 seconds during the 40 minutes when she was not talking. I am not fact-checking any of this so I apologize for errors, but here are some things she said that I found interesting: the pineapple is a sign of hospitality and when soldiers came home from war they would put it out front stuck on a post, so it is a symbol of welcoming guests; there are curved walls near doors so ladies could pass with big dresses; something about newel post at the staircase base where they would put wedding rings and a penny on top because they spent their last cent on the house (?? ); the columns out front are 26’ high and made of Cypress; this was Judge Bragg’s home just for the social season, which of course is Thanksgiving through Mardi Gras; and Mardi Gras really began in Mobile and not New Orleans; there are beds with posts that rise up from the frame for draping mosquito nets; many weddings are held at the mansion; most houses back in the day did not have closets because these counted as rooms for taxes; Mobile is the city of six flags, starting with the French in 1702. We did see a police car displaying these, and it was a trip to see a black officer driving a cop car with a confederate flag on it. After the mansion we went to the Brick Pit, which I covered in my BBQ post. A couple other things we considered doing in the area were the Oakleigh house, the USS Alabama and Bellingrath Gardens. 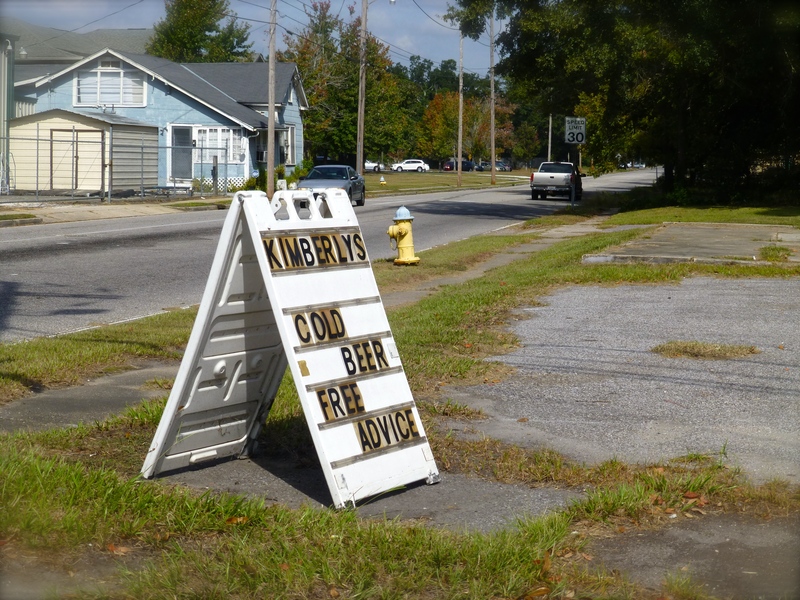 We also skipped the multiple bars with signs out front advertising cold beer and free advice, though I confess that is a strong offering. In Mississippi we made a brief detour to see the alleged world’s largest rocking chair. Jenni loves this stuff and her fear of heights was drowned by excitement. This entry was posted in Alabama, Florida, Mississippi, North America, Regions, Uncategorized and tagged Alabama, Fairhope, Mobile Bay, rocking chair, Tallahassee on December 10, 2013 by aleavitt77.